Intermodal centre of activity. 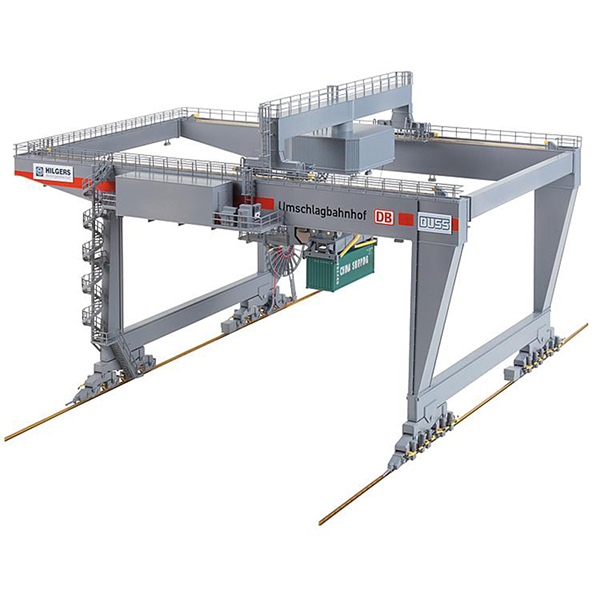 Transshipment station ensuring container traffic according to the original DUSS terminal of DSD HILGERS company on the Basle/Weil-on-the-Rhine site, comprised of a track-bound gantry crane transversally handling unit load devices along the transshipment tracks, dead-end sidings and extensive storage areas as well as a gantry-like crane jib with control cabin, trolley and telescopic grappler spreader that, like lifting slings, seizes the loads to be transshipped, such as e.g. 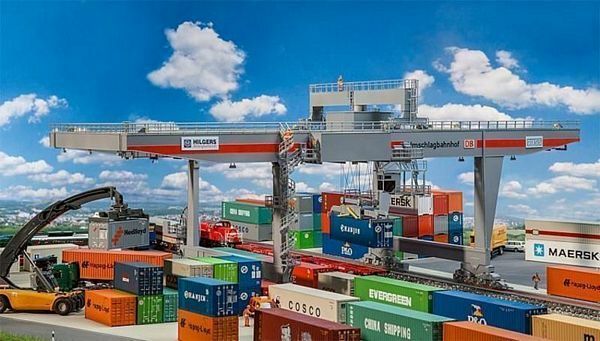 containers and interchangeable bodies, and places them in the targeted position. 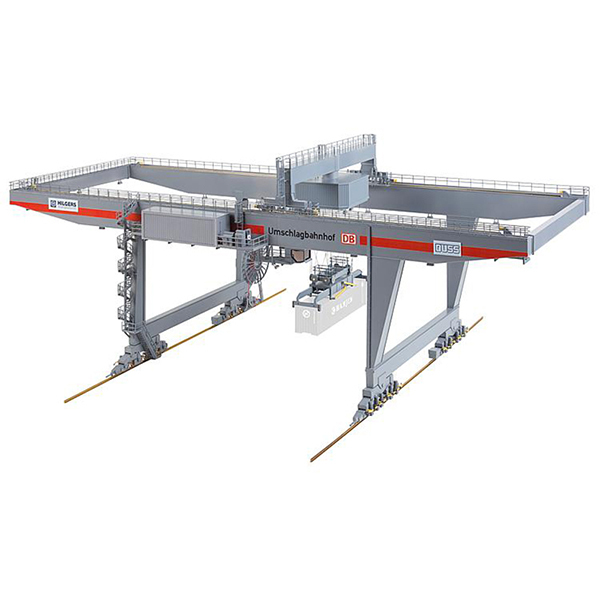 Suitable for the representation of handling processes on railway terminals and in fluvial ports with consignments which can arrive by road, too. Framework can be built with diverse length. Model without drive. Drive kit including motors and control device available separately. 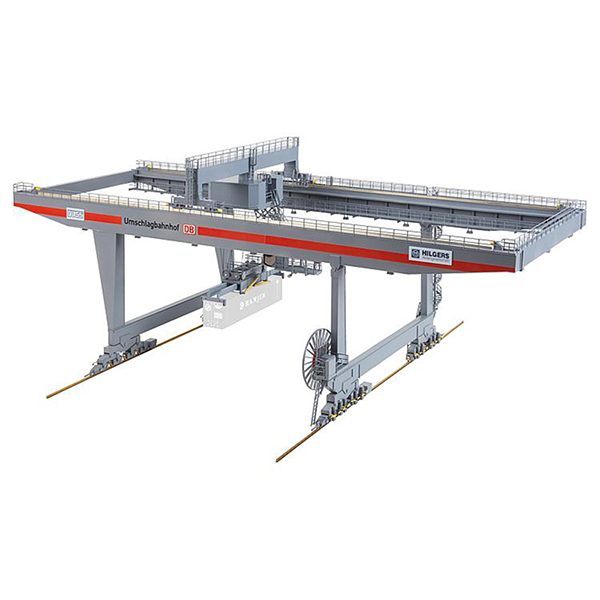 Container bridge-crane is controlled with the »Drive kit for container bridge-crane«, Art. 180290 without software installation, that is exclusively browser-based from any WLAN-capable desktop computer, notebook, smartphone or tablet (any such device not supplied). Functions: motion chassis forward/backward, motion travelling crab to the left/to the right, motion spreader up/down. Mobile elements can be stopped in any position. Products supplied: 4 motors, 2 motor regulating units, gears, toothed wheels, shafts, ball bearings, screws, stranded wires. Required Li-ion rechargeable batteries AA (Mignon) 3.7 V available separately. This building kit contains: 895 single parts in 3 colours, window foil, 2 decorations and 1 construction instruction. Use for handicrafts FALLER plastic and super glue. Model without drive. Drive kit including motors and control device available separately. 20' Container with the labeling of the »MAERSK« company. 20' Container with the labeling of the »EVERGREEN« company. 20' Container with the labeling of the »Hapag-Lloyd« company. 20' Container with the labeling of the »CHINA SHIPPING« company. 20' Container with the labeling of the »K-LINE« company.